I have done lots of cooking lately. I got sidetracked from my goal to re-make and write the recipes for the dishes (from Forme of Cury) that we made at Midwinter Feast. Last weekend a friend came over and he brought some nice reindeer meat with him. I have always wanted to make Furmenty with Venison from Take a thousand eggs or more –2nd book (Harleian MS. 4016, c. 1450). So I ended up testing two recipes that goes well with the reindeer. The Furmenty version is posted here now along with the Forme of Cury’s (from MS. Douce 257, Ancient Cookery c. 1381 part by S.Pegge) furmenty recipe that we made at Midwinter Feast. The other reindeer recipe from last weekend and “how to cook venison” I will post later. So this post is all about that thick wheat porridge, which is very familiar for all who have read medieval recipes. It is very commonly served with venison in meat days. There are lots of different versions of the furmenty (or frumenty, frumentee…) in sources from different countries and time frame. There are some similarities definitely in these recipes, but lots of differences. The 14th century recipe suggests that you can use almond milk instead of “swete mylk, sweet milk” and that is a good choice if you are making the furmenty with fish and as a Lenten dish (Forme of Cury has a Lenten version of furmenty with porpoise – at that time thought to be a fish). The recipe also suggests that you should use broth, (probably meat broth if non Lenten time) but the other recipe does not call for broth, just “fair water”. The 15th century dish says that sugar and saffron is added to the dish. So the dish should be sweet and sour and colored with saffron. The 14th century recipe does not advice to add sugar or saffron (although I did use saffron because I wanted to have more color to the dish). 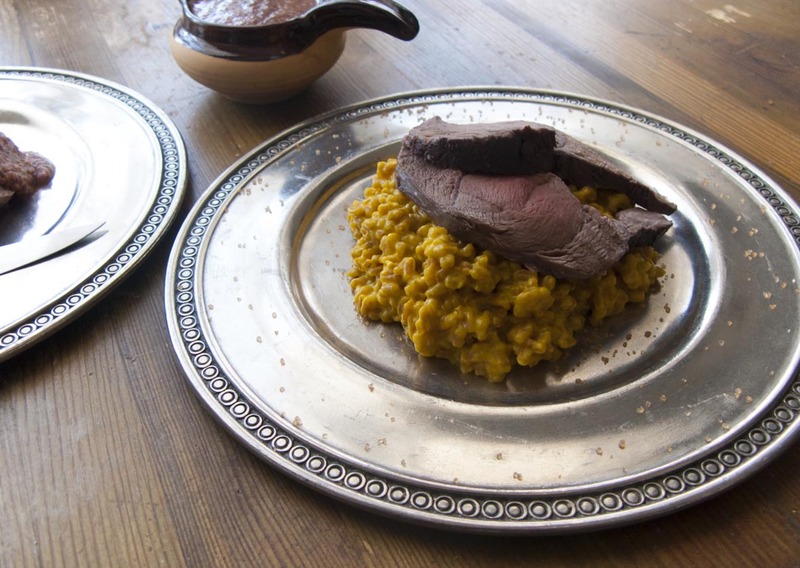 Both dishes say that furmenty is served with venison. 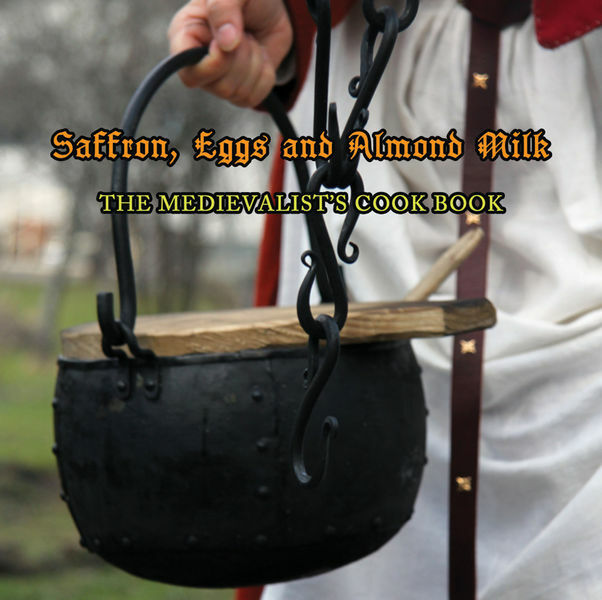 The 14th century recipe also says it can be served with mutton. Take fair wheat and bray it in a mortar. And fan away clean the dust, and wash it in fair water and let it boil till it breaks. Then take away the water clean, and cast thereto sweet milk, and set it over the fire. Let it boil till it is thick enough. And cast thereto a good quantity of separated raw yolks of eggs, and cast thereto saffron, sugar and salt; but let it boil no more then, but set it on few coals, lest the liquor wax cold. And then take fresh venison, and water it. Seethe it and cut it in thin slices. And if it is salted, water it, seethe it and cut it as it shall be served forth, and put it (in a vessel) with fair water, and boil it again. And as it boils, blow away the grease, and serve it forth with furmenty, and a little broth in the dish all hot with the flesh. Cook the spelt in water until the water has absorbed. 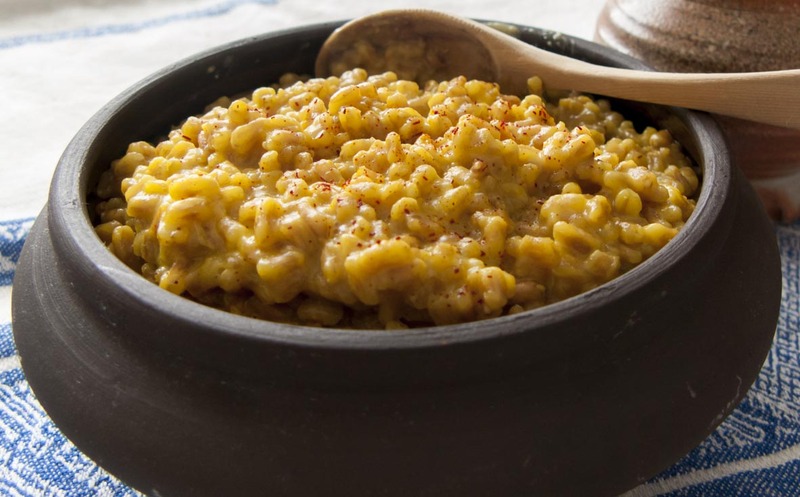 Add cream and saffron and simmer in a low heat until the cream has absorbed to the spelt. Add more water if needed. When the furmenty looks like a porridge and is done, add yolks, salt and sugar. Stir couple of minutes. Serve hot with boiled deer or reindeer meat (one recipe suggestion later). Comments: Sugar makes a nice twist in this dish! Do not be afraid to use it. Nym clene wete and bray it in a morter wel that the holys gon al of and seyt yt til it breste and nym yt up. And lat it kele and nym fayre fresch broth and swete mylk of Almandys or swete mylk of kyne and temper yt al. And nym the yolkys of eyryn. Boyle it a lityl and set yt adoun and messe yt forthe wyth fat venison and fresh moton. Cook the spelt in meat broth until the water has absorbed. Add cream (and a pinch of saffron if you want) and simmer in a low heat until the cream has absorbed to the spelt. Add more water if needed. When the furmenty looks like a porridge and is done, add yolks. Stir couple of minutes. Add salt if needed. Serve hot with boiled deer or reindeer meat or with cooked mutton. Comments: Saffron is not mentioned in the original text. Other furmenty recipes sometimes call for saffron. You can leave it away if you wish. Jouduin sivuraiteille viime viikonloppuna, tarkoituksena kun oli tehdä ruokia Sydäntalven juhlien pidoilta blogia varten ja keskittyä Forme of Curyyn. Kaveri tuli käymään meillä ja toi mukanaan poron paistia. Olen aina halunnut tehdä Take a thousand eggs of moren II-kirjasta perinteistä keskiaikaista vehnäpuuroa riistalihan kera (Furmenty with Venison, Harleian MS. 4016, ajoitettu n. 1450). Niinpä päädyin tekemään kaksi pororuokaa viime viikonloppuna. Furmenty (vehnäpuuro) versio poron kera on tässä alla sekä Furmenty, Forme of Curystä (peräisin MS. Douce 257 (Ancient Cookery) käsikirjoituksesta, joka on osa S. Peggen Forme of Cury reseptikokoelmaa), jota teimme myös Sydäntalven juhlassa. Aika sekavasti selitetty, mutta toivottavasti saatte jutun juonesta kiinni… Joka tapauksessa sen toisen viime viikonloppuisen pororeseptin ja “kuinka keittää poron paistia”- reseptin laitan tänne myöhemmin. Eli siis.. tämä blogipostaus koskee pelkästään tuota keskiajalla tunnettua vehnäpuuroa. Tätä kyseistä puuroa on kutsuttu monella nimellä, riippuen lähteestä (furmenty, frumenty, frumentee..). Se on tuttu monelle, jotka ovat tutustuneet keskiaikaisiin ruokaresepteihin. Furmenty tarjoillaan usein riistalihan kera, yleensä peuran lihan kera (muutkin vaihtoehdot käyvät, koska sana ”venison” voi tarkoittaa hirveä tai kaurista tms.). Näissä kahdessa alla olevassa reseptissä on paljon yhtäläisyyksiä, mutta toisaalta myös paljon eroja. 1300-luvun reseptissä neuvotaan käyttämään halutessa mantelimaitoa ”makean maidon” (tässä tapauksessa käytin kermaa) sijasta, mikä onkin hyvä vaihtoehto, jos ruuan tarjoilee kalan kera tai paastonajan ruokana. Forme of Curyssä on paastonajan versio tälle ruokalajille, joka on tehty mantelimaitoon. Paaston ajan furmenty neuvotaan tarjoilemaan hauskasti (?) delfiinin kera, jota tuohon aikaan pidettiin kalana. 1300-luvun resepti kehottaa käyttämään vehnän keittämiseen hyvää lientä (mahdollisesti lihalientä, jos kyseessä ei ole paastopäivä). 1400-luvun resepti taas ei neuvo käyttämään lientä vaan puhdasta vettä (jälleen hauska yksityiskohta, jota voisi pohtia enemmänkin). 1400-luvun resepti kertoo, että ruokaan tulee myös sokeria ja sahramia. Eli ruuan tulee olla suolaisen makea ja väriltään sahramin kultaista. 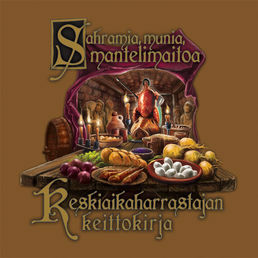 1300-luvun resepti ei neuvo lisäämän sokeria tai sahramia (tosin laitoin omaan versiooni sahramia, lähinnä värin vuoksi). Molemmat reseptit neuvovat tarjoamaan ruuan peuranlihan (tai vastaavan) kera. 1300-luvun resepti kertoo, että lampaan liha käy myös. Keitä spelttihelmiä vedesssä, kunnes vesi on imeytynyt spelttiin. Lisää kerma ja sahrami. Hauduta miedolla lämmöllä, kunnes kerma on imeytynyt spelttiin. Lisää vettä tarvittaessa. Kun speltti on puuroutunut ja kypsää, lisää munankeltuaiset, suola ja sokeri ja sekoittele muutama minuutti. Tarjoa kuumana keitetyn riistalihan kera (reseptiehdotelma siitä, miten keitetään poroa, tulee tänne myöhemmin). Kommentit: Sokeri tekee mukavan säväyksen tähän ruokaan! Älä pelkää käyttää sitä. Kommentit: Sahramia ei mainita alkuperäisessä reseptissä. Muutamissa muissa keskiaikaisissa furmenty resepteissä sahrami on tosin mainittu. Voit jättää sahramin pois, jos haluat. Frumenty with reindeer? Oh my, that sounds amazing. I’ve only had reindeer once, in Aarnimetsa more than 10 years ago now, but it was so rich and savory that I can’t imagine anything better as an accompaniment to frumenty!